The ECB, which is made by US brand Magnum, is just 700g, and has an outsole that can be used in both jungle and urban terrains. 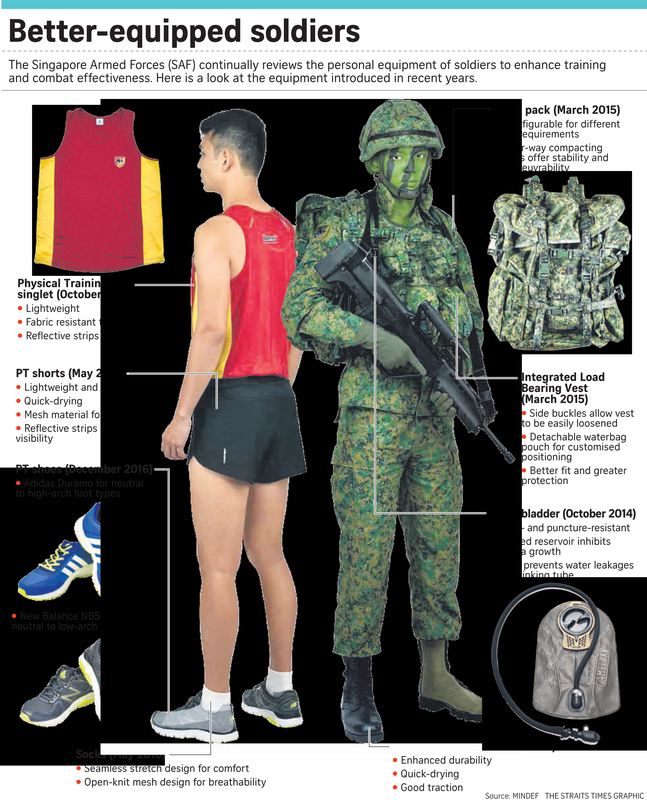 Soldiers of the Singapore Armed Forces (SAF) will soon be equipped with new boots that are more rugged, while preserving its users' comfort and agility. They will progressively replace the Frontier model boots, which, while lauded for being lightweight and fast-drying, had a major flaw - their soles came apart after being placed in prolonged storage. The Frontier boots have been in use for the past four years. The new boots come in two variations - the Army Combat Boot (ACB), which will be constructed with directly moulded soles, increasing their durability; and the Enhanced Combat Boot (ECB), which will have a cupsole that is fully stitched. These will combat the durability issues faced by the Frontier, which had three elements - a leather upper, a polyurethane midsole, and a rubber sole. While this kept the boots light, the polyurethane material tended to degrade, especially when placed in long storage. Because of hydrolysis, which is a chemical breakdown due to reaction with water, the sole separated from the shoe. The Frontier has a lifespan of two years, whether it is used actively or kept in storage. In comparison, the new ACB and ECB will stand up to two years of active use, and four years in storage. Lieutenant-Colonel Elizabeth Soh, head of the System Development Branch, HQ Supply, said: "The boots are differentiated to match the force types and mission tasks. The ACB is for the mainstream army and operationally ready national servicemen; the key outcome is durability. "The ECB is about performance... and (supplied) to selected active manoeuvre units - infantry, commandos, guards and armoured infantry." The ACB itself will come in two models - Wellco Peruana, a Peruvian brand, and Altama, a United States brand. Both weigh about 900g for a US size 9, and have synthetic breathable material that allows quick drying, with a sole suitable for jungle use. Lt-Col Soh said the models are similar but the SAF chose two manufacturers for supply resilience. In comparison, the ECB, which is made by US brand Magnum, is just 700g, and has an outsole that can be used in both jungle and urban terrains. The new boots will be available from Friday at selected SAF eMart outlets, including at Safra Mount Faber, The Chevrons club in Jurong, Gombak Camp and Pasir Laba Camp. From January, the SAF will provide the ECB to selected active manoeuvre units. And starting from May, recruits will be equipped with two pairs of the new boots - the Wellco Peruana and Altama. The Frontier's predecessor, the Gore-Tex, had been in service for a decade, but the Frontier is being replaced just after four years, after feedback from soldiers. Said Lt-Col Soh: "We are constantly reviewing the personal equipment of soldiers to better meet operational requirements and also to enhance combat effectiveness." Lieutenant Shahran Thanvagel, 20, who tested the new boots for two months, said each model has its merits. "The Altama suits the jungle terrain a lot better. It is durable and water drains out very quickly," said the Officer Cadet School (OCS) instructor. "The Magnum is suited for urban operations, because it is lightweight and the soles have markings which enable a quick change of direction, such as spinning on the spot. But the thick sole makes it hard to dry out." Second-Lieutenant Tan Hean Shuen, also an OCS instructor, felt that compared with the Frontier and Magnum boots, the Altama and Wellco Peruana boots have better cushioning in the lower shin area. "It helps for long distance (walking) comfort," he added.